The time has come. Too many cars, not enough storage/time/interest. 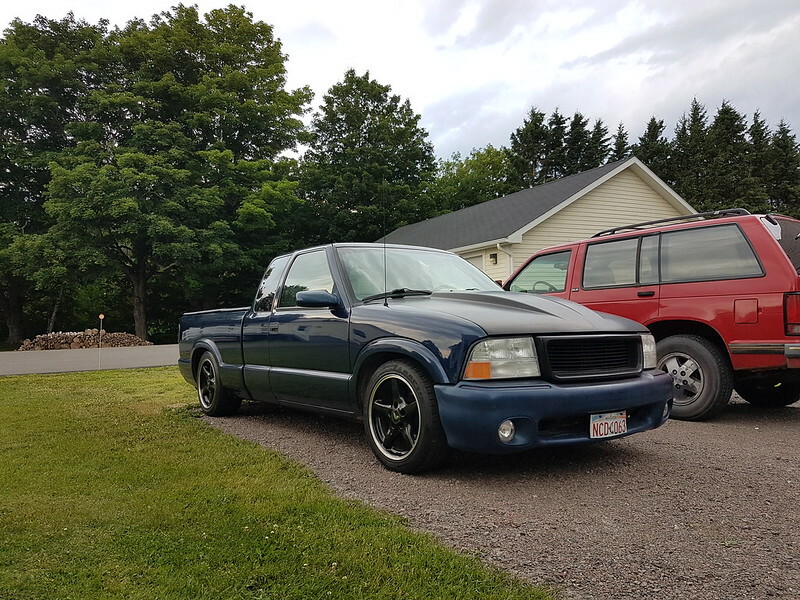 2003 GMC Sonoma 4.3L, automatic, ~155K kms. I've owned it since 2006. Was undercoated every winter it was driven and has been stored at least 5 winters but it still has some body rot - will need a passenger rocker panel (tiny hole that's likely hiding something larger) and there's a sizeable hole above the driver's side wheel on the box. Looks better in pics than it does close up. Have a rust-free southern box in the barn that can be included (or not) in the sale. Drivetrain has been immaculately maintained - runs strong, no smoke, trans shifts perfectly and always has. 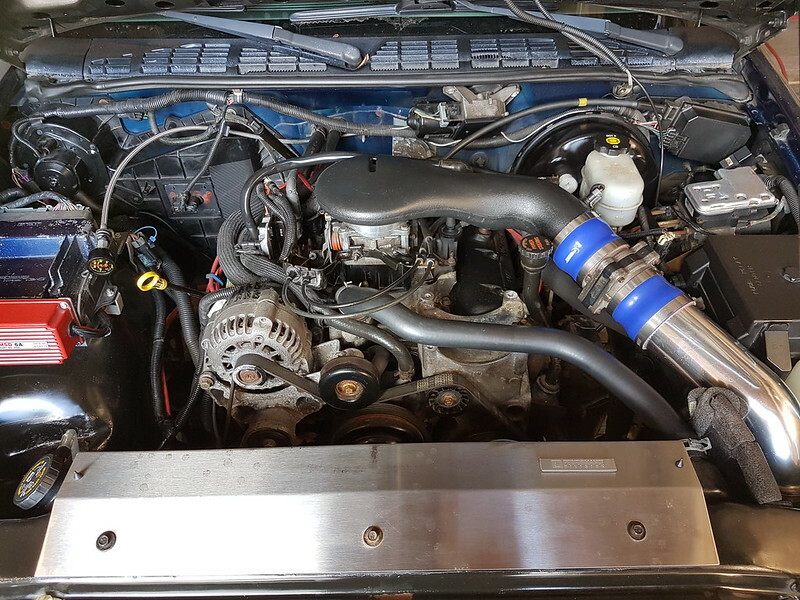 Mod list is extensive/boring, highlights include; 13" C5 corvette front brakes with Carbotech AX6 pads, non-existent in Canada 2wd blazer sealed bearing spindles, tubular control arms, tall ball joints for camber curve correction, single adjustable QA1 coilovers, 'built' rear diff with Torsen LSD, solid pinion spacer and girdle cover, quick ratio steering box, ZQ8 swaybars (largest available), AC delete including heater box and factory idler pulley, e-fans, custom tune, AEM wide-band O2 in custom HVAC mount, exhaust including rare SLP mandrel bent y-pipe, CAI, MSD ignition, UD pullies, HD motor and trans mounts, 17x9 wheels (will clear a square 275/40 setup), race seats, rare '98 Envoy bumper cover with fog lights, cowl hood, class 3 hitch behind roll pan with flip-down plate, SS mirrors, Extang tri-fold tonneau. It's 200+ lbs lighter than stock at just under 3400 lbs. Pros: handles better than a truck should and can still haul something if need be. Hugely reliable - the only thing that ever stranded me was a starter. Cons: rides like an ox cart on the street. Aforementioned rust. Standard GM rattles + squeaks. Fog lights aren't wired up. Needs ABS module (runs constantly if plugged in). Front bumper has a (repairable) split in it. Lots of paint scuffs, small dings, wheels look beat, etc. Needs heavier coilover springs installed (included) for better ride/handling. $3000 firm as it sits on worn out R888's but including a good set of Khumo slicks. I certainly had a lot of fun with it but it was never the truck platform that I really wanted for an auto-x project (regular cab, short box, manual trans, first generation S10/S15). Where is the “unsee” button?!!! No worries, my new alternate auto-X rig will be atypical as well!